I am back from the Annual Meeting of the Society in Raleigh, North Carolina, 11–14 November. I went two days early on Tuesday to have some time to shake the jet lag, and on Wednesday morning, the 10th, had the good fortune to have breakfast with Executive Director Jerry Baker during which we discussed current developments with the ResearchGate connection and the coming push to international expansion in chapters and members. Jerry was about to attend an all-day Board meeting, and I was simply looking forward to walking a bit around town and enjoying the nice day. It was 22°C (72°F) and sunny, a marked departure from Oslo, which was experiencing cold and snow. Raleigh is the capital city of North Carolina, yet is small by the standards of the big industrial cities up north, such as Chicago where I am from. The main street, Fayetteville, is easily negotiable north to south in 10 minutes, or 15 if on a stroll. At the north end is the state capitol, and along the street are shops, restaurants, banks, and the usual sort of establishments one finds in city centers. The Board did meet all day on the 10th, and again in the morning on the 11th, so the members had a good 10 hours or so of debate. As with many large societies these days such meetings are fraught with procedural citations and other structural minutiae inhibiting free discourse. This, of course, is what we need most these trying days, as the Society attempts to find a new direction toward robustness and prosperity. The meetings for all the delegates got under way on Thursday the 11th with a plenary session to set the agenda. All persons were quite civil, in contrast to what we would have later in the final session on Sunday morning. More on that later. The main theme of the Meeting, Food Safety, was pursued with vigor, and according to all reports, was well received. Topics included all manner of safeguarding food, from planting to harvest and distribution, to cooking and serving, to defense against terrorist attack. This is a very large and obviously important subject, as well all eat, and would like to have safe food. As well, the various awards were well assigned, and the speakers were informative and entertaining. The non-scientific recipient, Canadian TV journalist Bob McDonald, delved into the global warming and creationist debates in the denouement of his acceptance speech, a bit of unnecessary politicking in this listener’s opinion, but his acknowledged prerogative. The final Assembly of Delegates meeting was contentions, with one member directing a tirade against the parliamentarian for allegedly taking sides against him. Our President Joseph Whittaker was diplomatic in defusing this volatile accusation, apologizing for the society to the parliamentarian, whose role is merely advisory to the Chairman, who at the time was Executive Director Jerry Baker. A really positive part of the program was the Student Poster Competition, with once again, a sterling array of results displayed by these impressive young researchers. I served as a judge, and found it difficult to fault any of the presentations I heard. These students are at the vanguard of their fields already, and show great promise for their contributions and careers. All in all I had a really fine time, and anticipate that the great majority of my fellow delegates shared my view. 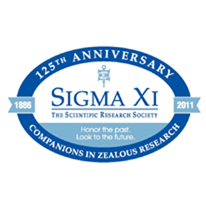 This entry was posted in Blog, Sigma Xi on 30.11.2010 by Paul Carlisle Kettler.